This is Victor Farelli's answer to: "Can you tell fortunes?" As magician you will occasionally encounter this question. Farelli describes and teaches a strong effect that can be done with a borrowed deck of cards. 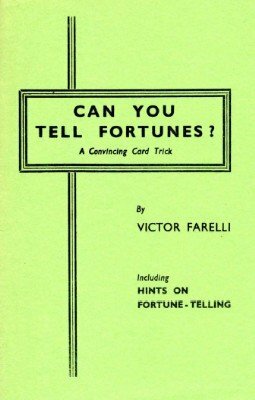 At the end Farelli includes some practical advice on fortune telling. Briefly, the effect is as follows. Having been requested by a lady in the company to tell her her fortune, the magician asks her to give him the date and the month (not the year - never ask the age of a woman!) of her birth. Pretending to make some intricate calculations, he informs the sitter that her "lucky" card is (say) the Ace of Clubs. The conjurer also tells her her lucky number. A card having been freely chosen by her, it turns up in the pack next to her so-called lucky card. A borrowed pack may be used, and the performer does not handle the cards in the course of the trick. This is a very strong point. In conclusion, the entertainer may, should he judge it advisable, give the lady a reading. 1st edition 1949; original 8 pages; PDF 15 pages.